It'd certainly sell a few pay-per-views. Georges St-Pierre's fighting future remains up in the air but one of his long-time coaches, Freddie Roach, is eager to see the former UFC welterweight and middleweight champion take to the Octagon one final time. St-Pierre has fought just once in the last five years, when he returned from a lengthy layoff to claim 185lbs gold by submitting Michael Bisping in 2017. And while he will turn 38 this year, 'Rush' has taken hardly any damage since 2013 so does not have as many miles on his clock as fighters of a similar age and he has previously hinted at a desire to claim one last payday before hanging up his gloves for good. Freddie Roach is more famous for his work with boxing greats like Manny Pacquiao, Miguel Cotto and Julio Cesar Chavez Jr. but he has trained some mixed martial artists in his time, with St-Pierre the most high-profile name to enlist the help of Roach. 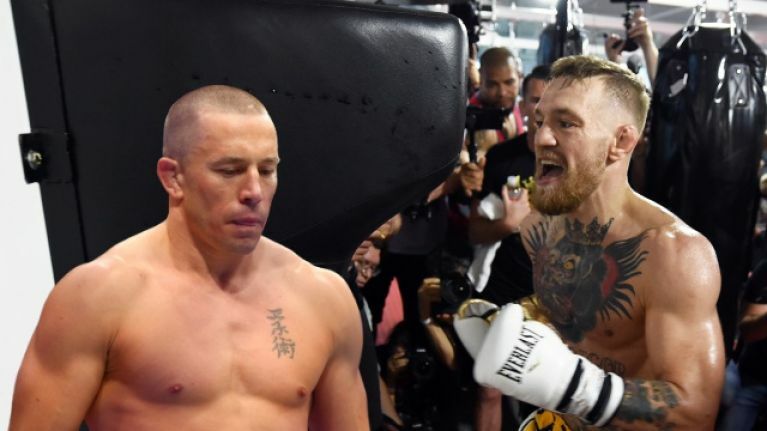 Roach has identified Conor McGregor as the ideal opponent for St-Pierre's swansong, insisting that the Canadian fighter would have no trouble making 155lbs for a lucrative clash with the ex-lightweight champ. "I think one more. Just one," Roach told Brendan Schaub on his Below the Belt podcast. "We’ll make the weight. Georges is on a new diet; it’s going really great. "We wanted to prove that we could go up to the higher weight division, and we did that. Then Dana (White) got mad that we dropped that title and we want to go to the lower weight now and be a world champion in three weight divisions."